I am heading to the annual meeting of the Assembly of States Parties tomorrow, but some early results from today's voting. As we've discussed (see here, here, here, here, and here), the ASP memebrs were charged with electing a new Chief Prosecutor and six judges. There is confirmation today that Fatou Bensouda (left), who emerged as a consensus candidate, has been elected as the new Chief prosecutor, as we predicted. Anthony Thomas Aquinas Carmona, 72 (GRULAC, List A), from Trinidad & Tobago. The remaining slots must go to one individual representating the Group of Latin American and Carribean States (GRULAC) and one from Eastern Europe. We also need two individuals from List A, who manifest criminal law experience, as opposed to List B, which covers individuals with IHL and human rights experience. Finally, there is a slot for one more male candidate. If you recall, the Independent Panel on ICC Judicial Elections found the Mexican, Cypriot, and Costa Rican candidates to be unqualified under either list. 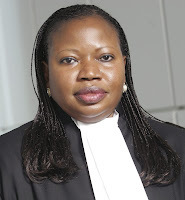 THank you Intlawgrrls for their coverage of the women candidates in this exciting ICC elections. Merry Christmas to all and many thanks ! You are the first website I found which has a full voting record. Thanks for that and please keep it that way for the next ballots, if possible! yes, please keep up the coverage..... I could not find any other website online that gave us prompt results ! While everyone thought the elections would run for about a week, Intlawgrrls published results within an hour or so.... Thank you so much Intlawgrrls ! Great reporting !